Scoring goals is important for all teams at every level in order to be successful. Players need to practice shooting and get lots of repetition in training sessions so they are prepared in games. A challenge for every coach is to find shooting drills that help players improve their skills while keeping them engaged. One of the best ways to do this is to find shooting drills that are competitive and fun for the players. That’s right, some drills can be fun and should be fun if you want to get the most out of your players. If players are excited when a drill is set up or asking about doing a certain drill before practice even begins, this is a good sign and indicator that they enjoy and like it. This drill is set up with players in a line about 20 yards out from a regulation size goal. One player starts in goal playing goalkeeper and a coach is located on the side of goal passing the balls out to the players running in to take a one touch shot from 10 – 15 yards. The rotation begins with the player shooting moving to play goalkeeper after taking his or her shot. The goalkeeper rotates to the back of the shooting line if they are still in the game. In order to stay in the game, a player must either make their shot or save a shot (missed shot over the goal or off a post counts as miss). If a player does not make their shot and does not make a save, they are eliminated. The last player left wins the game. The PK (penalty kick) knockout is very similar to the shooting knockout game, but players are now shooting from twelve yards out where a penalty kick would be taken from during a game. The rotation is still the same with the player that shoots going to play goalie and the goalie rotating to the back of the shooting line if they are still in the game. Players must either make their PK or make a save to stay in the game. If they miss their shot and don’t make a save, they are eliminated. The last player left wins the game. This is a game where players partner up to make teams that compete against each other. A goalkeeper or coach throws a ball into the grid in front of the goal (space can be adjusted based on numbers) and all teams try to win the ball and score on goal. Once a player scores, their team steps out of the grid and moves on to the next round. The game continues until the last team left each round gets eliminated. All the teams that scored and advanced come back into the grid to start the next round and the game continues. The last two teams advancing play against each other with two goals needed to win the championship (World Cup champs). All kids love playing this game and there are lots of skills that can be worked on while letting the players have a little fun. 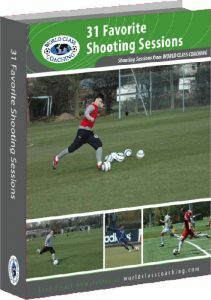 If you are looking for more shooting drills, check out the free gift below from World Class Coaching. Just click the link 31 Favorite Shooting Drills to get your FREE download. These 31 drills were submitted by soccer coaches from all over the world. They are available to you at absolutely no cost. Thanks to World Class Coaching for the generous offer.